The Friends of the Bridgewater Public Library will sponsor a book sale on Saturday, January 9th from 10AM to Noon. There will be a variety of gently used books for sale including a large selection of children's books. The Friends are also selling organic/fair trade coffee, cocoa and coffee mugs. The book sale will take place in the Flora T. Little Meeting Room on the lower level of the library. Parking is available in the back of the library located at 15 South Street in Bridgewater. A five week American Sign Language (ASL) program will begin at the Conant Community Center on Wednesdays beginning 01/06/09 and will run through 02/03/09. Two levels of instruction are now offered. Beginner ASL for those who have little or no signing experience will take place from 5PM to 6:30PM and advanced/voice off ASL will take place from 6:30PM to 8:00 PM. Each class will include cultural content. Students can attend one or both classes however registration is required as space is limited. The cost is $60.00 which includes all materials. EMT/Paramedic hours as well as Professional Development Points will be awarded according to state guidelines. Donations to the community food pantry will be accepted before and after class. Those needing ASL instruction due to reasons pertaining to deaf, hard of hearing or non-verbal family members will not be placed on a waiting list. To register, please call Marianne Molinari at 781.447.2470 or email her at manny66@msn.com. The Bridgewater 4th of July Committee will be holding an organizational meeting on January 19, 2010 at 5:30 PM at The Community Bank located on Main Street in Bridgewater. All members of the Bridgewater community are invited to share their ideas, thoughts and recommendations. The committee will be looking for ideas for fundraisers to help support the festivities for 2010. The Trustees of the Bridgewater Public Library have announced that the gutters on the library building at 15 South Street have recently been cleaned, repaired and some have been replaced. This project was undertaken thanks to the generosity of local resident and businessman Brian Healey. Healey is the owner of Brian Healey Contractors, Inc. and should you wish to thank Healey by supporting his business please call 508.378.8836 to discuss and schedule your project. Boy Scout Troop 88 is sponsoring their annual Christmas tree pick up fundraiser. Let the members of Troop 88 come and pick up your Christmas tree after the holidays! The pick up dates are Sunday, January 3rd and Sunday, January 10th. The suggested donation to have your tree removed is $7.00 per tree. To schedule your pick up, please call 508.697.6841. 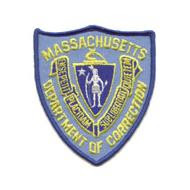 You can sign up for the Department of Corrections Alert Notification System by clicking here. Make sure you are prepared and sign up today. The Town of Bridgewater is pleased to announce that through the work of the Bridgewater Energy Committee the town has received a Big Belly Solar Recycling Unit through grant funds provided by the Massachusetts Technology Collaborative. The grant awarded to the Town of Bridgewater in the amount of $5,627.24 was used to purchase a solar powered recycling unit that will be placed at Legion Field in Bridgewater. The unit contains three separate compartments for bottles/cans, rubbish and paper and through an installed solar powered compactor compacts the refuse inside thereby decreasing the amount of times the rubbish and recyclables needs to be emptied. Chairman of the Bridgewater Energy Committee Carlton Hunt described the hopeful impact that the Big Belly Solar unit will have upon the town. "One of these units is a good starting place for the town to really drive people's thoughts about the impact that we can each have upon our town," explained Hunt. "The MTC grant funding this Big Belly Solar unit will allow the town to not only improve the recycling in town on a small scale at Legion Field but will hopefully serve as a visual to the residents of Bridgewater that small scale steps such as this can positively impact our town in a large way." The Energy Committee decided to place the unit at Legion Field because of the visibility of the location as well as the intended high usage the unit will get with sports drink bottles, water bottles and newspapers that are often times brought to the field. "It is our hope that this one unit that we secured through grant funds might spur other civic groups and/or private businesses in Bridgewater to partner with the Energy Committee in securing more of the units to place around town," explained Hunt. There will be a special town meeting on December 14th at 7:00 PM at the Bridgewater-Raynham Regional High School Auditorium. One of the major issues on the agenda will be the work that the Town Government Study Committee has now put to the voters of Bridgewater. The Town Government Study Committee will present an article at the STM on 12/14 that will give the citizens of Bridgewater the opportunity through an election in April 2010 to decide whether to adopt a charter form of government. The Town Government Study Committee (TGSC) has invested over 3000 hours in the research and development of recommendations that are positioned to guide the future of Bridgewater culminating with the development of charters as recommended and approved at May Town Meeting in their final report to town. These charters represent 2 potential new forms of government for Bridgewater: Town Council/Town Manager and Open Town Meeting/Town Manager. The charters put forth address the major concerns of Bridgewater's citizens notably financial management and accountability. Once approved by the town on December 14th, the charters will then proceed through a home rule petition/special act process with the state legislature. Upon completion of that process, the citizens would then have the opportunity in April 2010 to vote on onne of the charters or maintain the current governmental structure. The approval of Article #5 at the December 14th STM is a critical step toward taking positive steps of change that will set a new direction for the town and get us out of the deep hole that we are in. If the article does not pass, the entire process stops dead in its tracks. For more information about the recommendations, please click here. The Bridgewater Business Association is sponsoring Christmas on the Common this Sunday from 12:30 PM to 4 PM. The event will feature food, hot drinks, photos with Santa, pony rides, holiday music and local businesses booths. The Friends of the Bridgewater Public Library are currently selling coffee mugs with the slogan Sit-Sip-Read-Relax-Repeat. These mugs make great hostess gifts during the holiday season. The mugs are for sale at the library's circulation desk and will also be available at the Friends Book Sale this Saturday. The regular price of the mugs is $8 however until December 25th you can buy a mug for $6 with the purchase of Friends coffee of cocoa. For additional information, call the Bridgewater Public Library at 508.697.3331. The Friends of Williams and George Mitchell School Parents Association are sponsoring Santa's Workshop & Craft Festival. The event will be held on Saturday, December 5th from 9 a.m. to 2 p.m. at the Bridgewater Middle School located at 166 Mt. Prospect Street. All proceeds from this event will benefit the students at the George Mitchell Elementary, Williams Intermediate and Bridgewater Middle School directly. This exciting annual event will feature a "Just for Kids" Shop, photos with Santa, a bake sale, holiday crafts, raffles (including the new Ipod Nano and Game Stop gift cards), and a vendor/craft fair. The "Just for Kids" Shop offers hundreds of items priced at only $1.25 so children can purchase items for their family and friends. There will be more than twenty five vendors at the fair, including: The Cookie Jar, Mary Kay, Earth's Elements, Tastefully Simple, Tupperware and Lia Sophia. Also, stop by and see Jean Cochran, author and publisher of many children's books including "On A Dark, Dark Night." The Friends of the Bridgewater Public Library will sponsor a book sale this weekend! This is a name your own price event! Hope to see you there! An entertaining evening of spirit reading with Sandy Alemian in honor of transplant patient Ilene McBride will take place this Friday, December 4th. The event will take place at the Bridgewater Knights of Columbus located at 582 Bedford Street in Bridgewater and will take begin at 7PM through 10PM. Admission to the event is $35.00 for adults and tables of 8 may be reserved for $240.00 with pre-payment. Please call 508.353.9780 for advance tickets. The event will feature a cash bar, but please bring your own light snack. A 50/50 raffle will take place with 50% going to the winner and 50% going to the McBride family. 50% of all ticket sales also go toward Ilene's transplant expenses. Sandy Alemian is a local, well-known author, spirit medium, angel messenger and inspirational speaker. She co-founded Seeds of Hope and is offering her services to assist Ilene and her family through their unimaginable journey. Ilene has been battling Hodgkin's lymphoma since 2007 and doctors say a stem cell transplant is essential to her survival. She and her husband Tom have two young children in the B-R School System. If you cannot attend but would like to make an online donation, please click here. As a thank you to all of the former customers of Cake by Paula in 2009 and for any new customer living in Bridgewater looking to place an order , if you order a cake in 2010 you will save $10 of your custom order cake! Remember to book early so you are not left out in the cold. Cake by Paula creates the finest custom cakes for all occasions and each cake is baked fresh using only the highest quality ingredients. Make your next function even more special with a cake from Cake by Paula located right here in Bridgewater. Call 508.415.9890 or email cakebypaula@yahoo.com. No need to rush out of town this Black Friday. 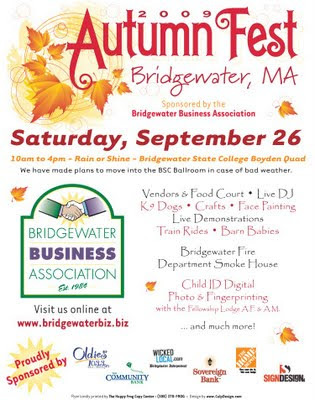 Stay right here in Bridgewater and find some great sales at local businesses! Uplifting Connections: 20% off all retail purchases when you spend $25 or more. Central Square Boutique: $10 off any purchase of $50 or more of $5 off any purchase over $25. There will be an open house at Bridgewater Art & Custom Framing on December 6th from noon to 4PM. The open house will be at Bridgewater Art & Custom Framing's new location at 50 Central Square in Bridgewater. Bring the kiddies to decorate homemade gingerbread ornaments. Take a break from the cold and enjoy mulled cider and chocolate covered caramel apples. Stop in and get a $10 off coupon. Holly Day Artisan Faire, Saturday, December 5th from 9 AM to 3 PM. Handcrafted items from local artisans, cookie walk, holiday greens, white elephant sale, book sale, soup and bread lunch, and visits from Santa at 12 and 2. Admission free. First Parish Unitarian-Universalist Church, 50 School Street. 508-697-2525. The Bridgewater State College Opera Group, under the direction of Donna Ames, will be performing their semester-end recital at Horace Mann Auditorium on Monday the 23rd at 7:30 PM. Works will include a variety of offerings including many of the works of Gilbert and Sullivan. Bridgewater State College's newly-established African Studies Program will host a Kick-Off event featuring Mr. E. Dovi Abbey, Community Organizer from West Africa, who now works in Roxbury, MA. Mr. Abbey will talk about "Community Organizing for Social Justice in Africa." Mr. Abbey manages African international educational exchange programs and serves on several community-based organizations in Boston and Africa. He is a member of the New England delegation to the National Summit on Africa and the Pan African Forum. He received the Crispus Attucks Community Service Award from the Boston Equal Rights League and other awards for his community service. This International Education Week event is Sponsored by the African Studies Program, the Social Justice League, and the Anthropology Department. Classes are encouraged to attend. This event is open to the public. Refreshments Served Tue, Nov 17, Dunn Conference B, Crimson Hall. The "Textures" Music Ensemble in Concert presented by the BSC Music Department Sunday, November 15 at 2 pm. An afternoon of exhilarating music including a world premiere original arrangement for Taiwanese ocarina by BSC student, Matt Ahrens. Also on the program: Pantomima and Cancion by Maneul de Falla arranged for trombone and piano and Le Chant du Veilleur by Joquin Nin for mezzo-soprano, saxophone and piano. The New Jerusalem Church in Bridgewater Center will be holding a craft fail on Saturday from 10 a.m. to 2 p.m. There will be a luncheon of chowder and sandwiches beginning at 11:30 a.m. Crafts will include jewelry, painted glass, quilts and much more. For additional details please call 508-697-3068. The annual holiday fair at the Bridgewater United Methodist Church will be held this weekend. The fair will take place on Friday from 5 to 8PM and on Saturday from 9AM to 3PM. Bridgewater United Methodist Church is located at 35 School Street. The public is invited to a reception honoring Elizabeth Gregg who will retire from her position as Director of the Bridgewater Public Library on November 19th. Betty has worked at the Bridgewater Public Library for 47 years. The reception will be held on Tuesday, December 1st at the Bridgewater Public Library. Please drop in between the hours of 4PM and 6:30PM to say good-bye and to extend your best wishes. A guest book is available for signing at the library's Circulation Desk. If you are unable to attend the reception please stop in the sign the book ahead of time and share your memories and thoughts. If you have any questions, please call Mary O'Connell at the library at 508.697.3331. The American Cancer Society Relay for Life of Bridgewater/Lakeville/Middleboro committee is holding a meeting on November 16th at 7PM in the downstairs of St. Basil's Catholic Center on the Bridgewater State Campus to share with residents the importance of Relay for Life in saving lives from cancer. Relay for Life is the signature event of the American Cancer Society. It is a funfilled, overnight event that mobilizes communities throughout the country to celebrate survivors (anyone who has ever been diagnosed with cancer), remember loved ones, commit to fight back through healthy lifestyle changes and raise money for the fight against cancer. "Relay for LIfe is as much an awareness raiser about the progress against cancer as it is a fundraiser," said Monica Querzoli, Co-Chair for the committee. "Individuals who are willing to give their time and energy to this exciting event as a volunteer or participant have made a commitment to fight back against this disease and let the community know that you can beat cancer." Teams of eight to fifteen members gather with tents and sleeping bags to participate in the largest grassroots fundraising event in the nation. Relay for Life brings together friends, families, businesses, hospitals, schools and communities. Teams seek sponsorship prior to the Relay, all with the goal of eliminating cancer. For more information on the November 16th meeting or if you would like to volunteer on the Relay for Life committee, please email Monica Querzoli at maquerzoli@comcast.net. On December 14th, there will be a Special Town Meeting where the Town Government Study Committee will be asking the citizens of Bridgewater to vote on an article which would result in placing two charter documents on the April ballot. The Charters are for 1) Modified Open Town Meeting/Town Manager form of government and 2) Modified Town Council/Town Manager form of government. Creating Charters was the direction the committee was given last May at Town Meeting after presenting their final recommendations. The value of moving to a charter is to create a basic framework for our govt structure- it gives the town increased autonomy from the state and creates a more professionalized structure to town government operations with clear lines of authority and responsibilities for the legislative and executive branches. The committee is working diligently to inform the public as to the details of these charters so they can make an informed decision and see the value of a charter-driven town as opposed to our current form under by-laws. So how can you help? In addition to public forums and BTV taping, the committee is seeking volunteers willing to host a coffee hour at their house- inviting friends to learn more. If you are willing and able to host a coffee hour, please let the town government study committee know the of some potential dates and times that would work for you. You can contact the committee by emailing Sheila Whitaker at jswhitaker@comcast.net. Finally- mark your calendar and make plans now to attend this very important town meeting. Selectman Demos who is quoted below. "The crisis Bridgewater faces goes well beyond finances. The crisis is not only financial, but also, of whom we are. Our current structure of local government is outdated, not functional, and no longer serves the townspeople well. The Bridgewater Center Neighborhood Association has been formed. From their website the association is, "...group of politically impartial and concerned citizens who through partnership with like minded local businesses and citizen groups, seek to work with each other through proper education, information and personal support in order to assess, improve and secure the vitality and quality of life of all residents of Bridgewater." For more information about the Bridgewater Center Neighborhood Association please bookmark their blog at http://bridgewatercenter.blogspot.com/. Songstress Emilia Dahlin will perform a benefit concert tomorrow night (November 6, 2009) at Bridgewater First Parish Church located at 50 School Street. The concert is at 8:00 PM with doors opening at 7:30 PM. Tickets are a donation of $8 to $15. This Saturday (November 7, 2009), Central Square Boutique will donate 20% of all sales to the Laurie Scott Family. Laurie was diagnosed with breast cancer in July and has since undergone three surgeries and faces others. She is currently undergoing chemotherapy and radiation treatments and due to this Laurie has been unable to continue working. With the holiday season right around the corner you will be able to stock up on some presents and help support Laurie's family during her cancer treatment. The party room at Central Square Boutique will be set up to make stretch bracelets or bookmarks for $5.00 with 50% of those proceeds going to the family. These make great teacher gifts and stocking stuffers! The Holly Berry Craft Fair will take place at Stone Meadow located of Plain Street in Bridgewater this Saturday from 9AM to 2PM. Hosted by the residents of Stone Meadow, the fair will feature crafts, jewelry, candles, baked goods, food court, Victorian tea room, Grandma's attic and raffles. Admission to the Holly Berry Craft Fair is free. Bridgewater Art & Custom Framing has relocated to 50 Central Square in Bridgewater, right "Around the Common." Make sure you stop in and see Candace and see the amazing art work that is available right here in Bridgewater! Beacon Hospice is offering a free grief education series and support group. It will be held on Wednesday at 1 p.m. at the Trinity Episcopal Church located at 91 Main Street. Pre-registration is required by calling 508-747-7222. Where: State House --- outside what's known as "The Well"
The trustees and Friends of the Bridgewater Public Library are staging a rally in front of our own library to run simultaneously with the Boston Rally. If you can stop by either rally, your library patrons and staff would greatly appreciate the support. Take your lunch hour Wednesday to support libraries. Please also contact Rep. Dave Flynn and Senator Marc Pacheco and demand that they stop the cuts. Public libraries are needed more than ever in these difficult times. The TGSC is currently looking for volunteers to help the citizens of Bridgewater become educated on the two forms of Charter Government that the committee has developed. There will be a Special Town Meeting on December 14, 2009 asking the citizens to vote in favor of putting the two Charter options on a ballot to be voted on in April 2010. The committee is looking for people to distribute informational flyers throughout your neighborhood, host a coffee and invite all your neighbors or participate in a BTV live panel audience event. We are trying to reach and educate as many citizens as possible before the STM in December. If you are interested in helping us out please email me your name, address, phone number and what area you would be interested in helping out with at slboudreau1@verizon.net . Either I or one of the other committee members will contact you with information regarding dates, times, materials, etc. for the area that you have volunteered for. The Bridgewater Housing Authority is pleased to announce the launch of its new website. Please click here to review the website. Bridgewater business Your Design Studio created the new website. Bridgewater State College will conduct a test of its outdoor warning siren on Wednesday, October 28 between 12:05 and 12:20 p.m. The siren is installed atop the college’s Maxwell Library on Shaw Road. The siren will sound a loud warning tone, followed by a brief audio message noting that the broadcast is a test. The siren is part of BSC’s campus alert system, which has been developed for the purpose of notifying the Bridgewater State College community in case of an imminent threat or danger on the campus or in the immediate vicinity. The test is being conducted to ensure that the audio warning system is in proper working order. Campus community members and neighbors in the surrounding area who may hear the siren on October 28 should not be alarmed by the siren, as it is only a test. Around the Common Clean-Up a Success! Thanks to those who showed up for the Around the Common clean-up. We hauled 15 large bags of trash and leaves out of downtown. Cups, cigarette packs, candy wrappers, food wrappers and more have been taken off the street! Special thanks to Bridgewater resident Tracy Hunt of Tracy's Floral Designs for donating the trash bags for the event! The Around the Common Clean Up will be held tomorrow rain or shine from 8 AM to 10AM. If you plan on attending, please try to bring trash bags, rakes, brooms, etc. If you plan on attending, please email aroundthecommon@gmail.com. Mark you calendar for an exciting art reception to be held at Bridgewater Art & Custom Framing this Saturday from 6 to 9PM. The event will feature free refreshments and will feature some of the finest local artwork around. For more information, check out Bridgewater Art & Custom Framing's website by clicking here. The residents of Concetta Drive will be hosting a block party fundraiser to benefit Laurie Scott, who is battling breast cancer. The event will take place October 17th. There will be food, live entertainment by Right Turn Clyde, two moonwalks, face painting, a 50/50 raffle and a fishbowl raffle. Raffle prizes include Red Sox tickets, Bruins tickets, a Pandora bracelet and golf passes. All proceeds will go directly to the Scott family and help them with expenses during Laurie's treatment. Tickets for the event are $20 each with kids 16 and under admitted free. Tickets can be purchased by calling Susan Hearn at 508-279-6325 or Ann Doherty at 508-807-0158 or upon entering the street on the day of the event. The Thimbles and Friends Quilt Guild will be sponsoring a Quilt Show on October 17th and 18th from 10 a.m. to 4 p.m. at the Cole Yeaton Senior Center. There will be quilts, vendors, raffles and a quilter's boutique. Admission is $5 or $3 with a canned good for the food pantry. Children under age 12 are admitted free. The transfer station is looking for additional volunteers to help out there. If you have any time that you would like to volunteer, please contact Board of Health member Brian Penney at 774.259.0301. Back in May of this past year, town meeting voted to accept the Town Government Study Committee's final report, and granted the TGSC a 12 month extension during which time they would prepare several charters which reflected the 2 recommended form of government options: Council/Manager and Modified Open Town Meeting. Other recommendations would also be included in these charters. There is a 3 step process for moving forward with these charters: approval of the charters at a Special Town Meeting scheduled for December 14, approval by the state Legislation and Governor, and finally approval in a town election. 1. Would give the town increased autonomy from the state. 3. Would serve as the basic framework for the future essentially creating a general plan of municipal government that is responsive to the electorate and community while at the same time capable of doing the work of the town effectively translating the voters’ intentions into efficient administration as promptly and economically as possible. It is critical that the citizens of Bridgewater begin to educate themselves on these charters. A key component of the Public Education program will be a series of forums that have been scheduled by the TGSC over the next 2 months. Currently, 4 have already been scheduled. All educational forums are to be held at the Senior Center. The TGSC is also planning to present material at a pre-town meeting forum as well. Around the Common is pleased to announce that we will be sponsoring the Around the Common 1st Annual Fall Clean-Up! This event will bring together the Bridgewater business community, residents and friends to spruce up the downtown area before the wintertime. If you taken a walk through downtown recently you will agree that this event is much needed and will be a great way for each of us to give back to our community. Location: Around the Common, where else? We will plan on meeting in the parking lot of the Academy Building and will work our way toward the railroad tracks. What to bring: Gloves, trash bags, rakes, brooms, etc! Business owners: Can you donate trash bags? Coffee and donuts? Case of water? Maybe dumpster space? If so, please contact me. Please email aroundthecommon@gmail.com if you plan on attending or confirm your attendance on Facebook by clicking here. The Strength Studio Offering First Class Free! The Strength Studio, a newly opened women's workout facility located on Hale Street in Bridgewater, is offering one free workout class to all ladies in town! The Strength Studio features cardio classes, spinning classes, step classes and more all in a comfortable atmosphere. Check out The Strength Studio's website for more information on classes. Shannon Brownlee, an expert on American health care reform, is this years Bridgewater State College Distinguished Speaker Series presenter. The lecture will take place on October 22, 2009 from 7:00 PM to 8:30 PM in Boyden Hall at Bridgewater State College. For more information about the event and to register for two free tickets per household, please click here. The Board of Selectmen has announced the agenda for their meeting on October 13, 2009. The meeting begins at 6:30 PM. The Town of Bridgewater is looking for snow plow and sander contractors for this weekend. Rates are from $70 to $125 per hour with a 4 hour minimum per storm. For more information, please call 508.697.0931. It's no secret that cities and towns have been hit hard by the economic recession and many have been struggling to preserve jobs and protect essential services like public safety. That's why Governor Patrick and I are providing immediate, critical relief to municipal fire departments impacted by budget cuts that have forced layoffs and vacancies. Our Administration is releasing $8.1 million in federal stimulus funds to 13 municipal fire departments to rehire 127 firefighters who were laid off because of budget reductions. As a former Mayor of Worcester, I know how important it is for cities and towns to protect critical priorities like public safety. These funds will help bring back lost jobs, retain public safety and stimulate the local economy. The $8.1 million will be used to rehire a total of 127 laid off firefighters in Bridgewater, Easton, Fall River, Hull, Lakeville, Lawrence, Methuen, Monson, New Bedford, North Attleboro, Quincy, Walpole and Worcester. This is just the first round of awards to municipal fire departments. Our Administration will be awarding another $11.9 million in federal recovery funds to communities that have seen their fire departments downsized as a result of budget cuts. In total, $71 million in federal recovery funds are being directed to local public safety officials who continue to face difficult budget challenges caused by the unprecedented global economic downturn. I thank President Obama and members of our congressional delegation for making these funds available to help cities and towns put people back to work and keep communities safe. Walk-in registration for both Boys and Girls Recreation League Basketball for the 2009-2010 season will be held on October 16th and October 17th. 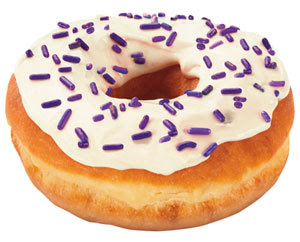 The hours are from 6:00 p.m. to 9:00 p.m. on Friday the 16th and from 9:00 a.m. to noon on Saturday the 17th. Registration will take place at the Recreation Department building on Cottage Street. Additional details can be found online at www.bridgewaterboysbasketball.com for boys programs and www.bridgewatergirlsbasketball.com for girls programs. Bridgewater Art & Custom Framing will be sponsoring a Spooky Studio Day on Saturday, October 17th! The event will take place from 10AM to 4PM and is complete with refreshments and fun. If you dress in a costume, you will receive 50% off Paint Your Own Pottery. Make sure you mark your calendar for this great event! Volunteers Needed for “Outdoor Clean Up" at the Bridgewater Public Library. The outdoor area of the Public Library needs extensive weeding. Please bring rake and shovel! Please contact Library trustee Jim Kirkcaldy if you are able to donate your time! The volunteers also need someone with a truck to cart the waste away and a place to dispose it. There will be a golf tournament to benefit the Bridgewater-Raynham Regional High School baseball team that will take place on October 17th at River Bend Country Club in West Bridgewater. The tournament will begin at 1PM and is a shotgun start format. The tournament costs $130 per person which includes a cart and steak dinner. For more information, please call John Kearney at 508.697.6902 x. 13120 or email John at jkearney@bridge-rayn.org. ATC Readers: Keep Meetings Open! By the largest landslide victory in the history of Around the Common, Bridgewater residents want the Board of Selectmen to retain the Open Forum portion of Selectmen meetings. The residents have clearly spoken! Let's hope the elected officials listen. The 2009 Dog Licensing Period runs from July 1, 2009 through June 30, 2010. The new 2009 licenses are now available for sale in the Town Clerk's Office. Dogs not registered by September 1st will be charged a fine in the amount of $25.00 in addition to the cost of the license as required by the Dog By-Law. Town Clerk's hours are Monday through Thursday 8 a.m. to 4 p.m. Licenses may also be obtained by mailing a request to Town Clerk's Office, Town Hall, 64 Central Square, Bridgewater, MA 02324 along with the proper fee, self addressed stamped envelope and a copy of current rabies certificate. If you have additional questions please call 508-697-0921. The Children's Room of the Bridgewater Public Library celebrated the end of their Summer Reading Program on August 6th. An ice cream party was held in the Flora T. Little Meeting Room with 99 attendees. Winners of the bike raffle were announced: Max Dube, TJ Mulcahey, Kailyn Demos, Jenna Schlosser, Alyssa Kirk, Louis Brechter, Lauren Dion and Jacob Schlosser. The winner of the "Guess How Many Jar" was Alison Whittaker, who was very close with a guess of 1400 (the true number was 1421). The Library Trustees would like to congratulate the 234 Starship Adventure program participants who read a total of 1,753 books from July 7th through August 6th. The bike raffle and ice cream party were sponsored by Estabrook and Chamberlain Insurance Agency of Bridgewater. This Week's Poll: Open Forum at Selectmen's Meetings? There has been a lot of discussion relative to the Open Forum section at each Selectmen's meeting. Proponents of the Open Forum (including Selectman Chris Flynn and Selectman Mike Demos) feel as though Open Forum is essential to preserve democracy and the freedom of speech that residents should be allowed to exhibit within their own local government. Opponents (including Selectman Stan Kravitz) feel as though Open Forum at times detracts from the regular agenda and the discussion at Open Forum often becomes personal. For more information about the debate, please click here. This week's poll question addresses the issue. Please vote! The results are in and Around the Common readers agree that any effort to fill the elected positions of former Selectman Herb Lemon and Treasurer/Collector Doug Dorr should wait until the next election in April. Services offered included house/church/small business cleaning, pet care, odd jobs and driving needs. For more information, check out the new blog by clicking here. Sunday's Boston Globe discussed town buildings across the state and Bridgewater's own historic buildings were discussed. Click here to read the article. Community Preservation Chair Marilee Kenney Hunt has drafted the following letter to the editor relative to the article. I applaud your spotlight on the deplorable condition of many Massachusetts Town Halls. Certainly, in New England, preserving the historic integrity of our cities, towns and villages often begins with municipal buildings. I wonder, then, why you did not mention the incredible advantage the Community Preservation Act (CPA) affords 142 Massachusetts communities. In Bridgewater, which is cited extensively in the article, two town employees describe the deplorable state of the Town Hall and Academy Building including a lack of accessibility. Full disclosure: A reporter also spoke with me about those buildings since I chair the Community Preservation Committee. While I am not surprised by the apt description of our unmaintained buildings, I was incredulous to read not one word noting the active intervention of the Community Preservation Committee. At Bridgewater's 2007's Spring Town Meeting, the town appropriated $60,000 from the CPA for a comprehensive, architectural, condition and use report on all four municipal buildings to serve as a road map for their preservation and restoration. Based on that report, at the Spring Town Meeting in 2008, $15,000 from the CPA was appropriated for accessibility upgrades to the Academy Building and the Fall Town Meeting appropriated an additional $622,356 from the CPA "…for the purpose of partially restoring and preserving the Bridgewater Town Hall...and the Bridgewater Academy Building…"
Although revenues are down and Bridgewater struggles to maintain basic services, its citizens had the great good sense to pass the Community Preservation Act in 2005. Far from being a complete panacea, it can and is being used to preserve and restore our historical buildings, retain and create open space and ensure affordable housing—keeping irreplaceable, precious assets of our towns intact through these difficult times. Those facts are as true as the dilapidation and disrepair. They were relevant and should have been noted in your article about our decaying town treasures. The Fall Town Meeting will be held on Monday, November 9, 2009 at 7:30 P.M in the Auditorium at the Bridgewater Raynham Regional High School. At the Selectmen’s Meeting on August 4, 2009, the Board voted to set the deadline for submission of Articles. ZONING ARTICLES Must be received in the Office of the Selectmen, Memorial Building, 25 South Street, no later than 12:00 p.m. on Thursday, September 10, 2009. ALL OTHER ARTICLES Must be received in the Office of the Selectmen, Memorial Building, 25 South Street, no later than 12:00 p.m. on Thursday, October 8, 2009. The Bridgewater Public Library has received a donation of $5,500 from Estabrook & Chamberlain Insurance Agency. The donation will fund periodical subscriptions including the Boston Globe, Boston Herald, Wall Street Journal and other newspapers plus popular magazines such as Consumer Reports, People Weekly, Health, Newsweek, Time, US News & World Report, Psychology Today, Sports Illustrated and many more. Through their generosity, eighty eight subscriptions have been made available for the coming year. This is the first year that the library's periodical subscriptions have not been paid for by the Town of Bridgewater. Without the support of Estabrook & Chamberlain, the library would have no magazines or newspapers in FY 2010. Periodicals are located in the library's Browsing Area near the Circulation Desk. May of the library's magaznines may be borrowed, but newspapers remain in the library. On October 18, 2009 Beth Ann and I will be running the Baystate Marathon in Lowell, Massachusetts. In addition to running the marathon, I have decided to raise money for the Friends of the Bridgewater Public Library and ask for any donations you might be able to make. I will do the hard work of running 26.2 miles and you can show your support of my run by donating to the Bridgewater Public Library. Any donation is welcome! Click below to donate.